In readiness for Chinese New Year tomorrow, Westholme Senior School students started the celebrations in the Learning Resource Centre with Mandarin Language Assistant Mrs Ji Song and Mandarin teacher Mrs Min. Mrs Ji Song, an English Teacher from Suzhou, China is spending 12 months assisting Mrs Min in improving the students Mandarin speaking skills. Students from all years enjoyed playing Jian Zi – a traditional Chinese game and learning the ancient art of Chinese Paper Cutting. 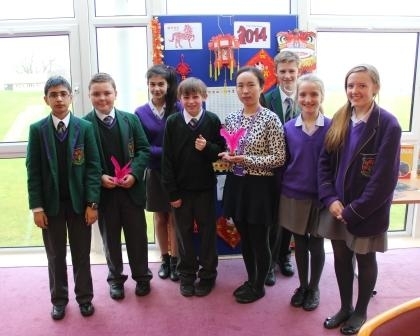 2014 is the year of The Horse, Westholme wishes everyone a happy Chinese New Year!